SpaceX has successfully launched a Falcon 9 to orbit during its BulgariaSat-1 mission Friday. The launch reused a first stage booster first employed during an Iridium Communications mission in January of this year, after that Falcon 9 first stage was recovered and refurbished. The mission on Friday was to delivery Bulgaria’s first ever geostationary communications satellite into orbit, so that it could begin operations broadcast communication networks and HDTV signals for clients on Earth in parts of Europe. The satellite was built by SSL out of Palo Alto, California. The first stage also landed successfully on the company’s drone ship in the Atlantic ocean, “Of course I still love you,” making it the first ever to have successfully landed on both of SpaceX’s two ocean-borne drone landing vessels. 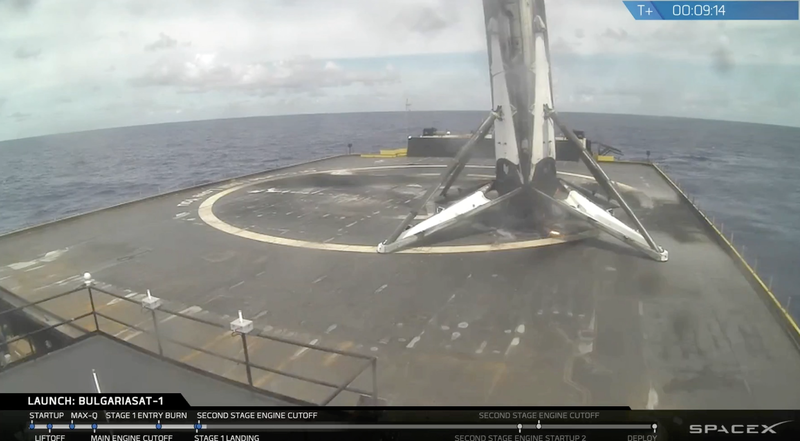 That recovery was also the most challenging successful landing so far for SpaceX, because of launch conditions. SpaceX founder and CEO Elon Musk warned on Twitter prior to the launch that the Falcon 9 used would “experience its highest ever reentry force” during today’s launch, along with record levels of heat, making it less likely that SpaceX will be able to successfully recover the rocket for reuse this time around. In fact, Musk said there’s a “good chance” they don’t get the rocket back. The launch from Pad 39A at Kennedy Space Center is the second ever re-use of an orbital rocket, after SpaceX successfully completed its first reflight of recycled Falcon 9 first stage back in March. The primary mission was also a success, with SpaceX deploying the BulgariaSat-1 satellite into geostationary transfer orbit as of around 3:45 PM EDT. Next up, SpaceX will attempt its Iridium-2 mission launch on Sunday, June 25.